Najey Blavijo, left, an undocumented senior who hopes to get financial aid to attend college. 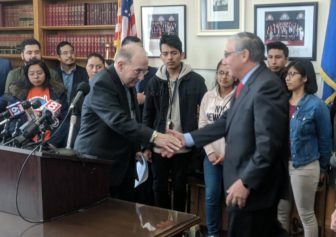 Legislation that would make some undocumented immigrants eligible for college financial aid will win enough votes to pass the General Assembly after years of unsuccessful attempts, legislative leaders predict. The state Senate passed the bill Wednesday on a vote of 30 to 5, and the speaker of the house promised to have his chamber vote on the legislation before the session ends in three weeks. Democratic Gov. Dannel P. Malloy promises to sign it into law. 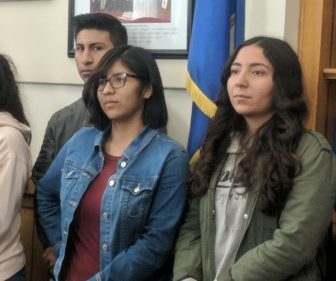 The bill makes undocumented immigrants eligible to apply for help from the $150 million pool of financial aid the state’s public colleges and universities provide each year. Not all undocumented residents will be eligible, however. To qualify someone must have moved to the U.S. before they turned 17 years old, attended a Connecticut high school for at least two years and be under age 36 by June 15. State residents who are undocumented and have served in the military and are honorably discharged also will be eligible for aid. The Senate passed similar legislation in 2015 and 2016, though this year there was broader Republican support, including from Sen. Art Linares, the Republican co-chair of the legislature’s Higher Education Committee. He had not supported nearly identical legislation in the past. Sen. Beth Bye, the Democratic co-chair of the Higher Education Committee, celebrated the bill’s prospects. “This is the best of Connecticut. We are opening our doors and opening up access to higher education,” said Bye, of West Hartford. A Senate amendment Wednesday would make undocumented residents eligible to apply for aid beginning in January 2020, while honorably discharged veterans could apply upon passage of the bill. With Senate approval Wednesday, the bill now heads to the House, which has never even raised the issue for debate before. This year will be different, House Speaker Joe Aresimowicz, D-Berlin, promised. “We will bring it up in the House. I believe the national debate on areas of undocumented students in states has changed the feelings of some people in the House,” he said. House Majority Leader Matt Ritter, D-Hartford, said he believes the votes are there to get the bill to the governor’s desk. The Democratic and Republican leaders of the state Senate shake hands before taking turns to explain why undocumented students deserve access to financial aid. Numerous House Republicans voted in support of the legislation in committee, a departure from previous years. Two House Republicans also co-sponsored the legislation. Opponents in the past have said they foresaw crowding some legal residents out of the financial aid pool if undocumented students were given access. Concerns also were raised about the timing of expanding financial aid when state funding is being cut for public colleges and universities. A series of changes have been made over the last six years to help lower college costs for undocumented students. In 2011, state law was changed so that undocumented students who attended all four years of high school in Connecticut qualified for the much lower in-state tuition rates at public colleges. In 2015, the law was changed to lower the requirement to two years of high school. Just under 100 students benefit from these lower tuition rates at UConn, and its unclear how many benefit at the state’s community colleges and four Connecticut State Universities. But several of those who have testified for the bill say the $4,300 annual in-state price tag to attend a community college, $13,200 to attend a Connecticut State University and $15,700 to attend the University of Connecticut still put college out of reach for many. A group of high school students who could benefit from the legislation were at the state Capitol to watch the Senate action on the bill Wednesday. Najey Clavijo, a senior at Danbury High School who was brought to Connecticut at age 13 from Ecuador, plans to apply for help to attend Naugatuck Community College to study computer engineering. Mirror reporter Clarice Silber contributed to this story.